Today, after reading “CNN Transcript: Chinese activist Chen Guangcheng” I realized I was so wrong and wrote the following. 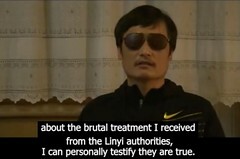 This is a horrible turn of event in the words of Chinese blind activist lawyer Chen Guangcheng and his wife Yuan Weijing. Reading Chen saying “(My wife) was tied to a chair by police for two days. Then they carried sticks to our home, threatening to beat her to death. Now they have moved into the house” breaks my heart and makes me realize I was wrong in thinking that Chen could and would want to stay in China. The world is watching how the US and Chinese governments will behave tomorrow and in the next few days. I am sadly pessimistic. I know Secretary of State Hillary Rodham Clinton will be in China Thursday (“is already”? because of time difference). All eyes will now be on Secretary Clinton and President Obama’s actions. At the moment, I am sadly pessimistic. Crisis (危機): Will blind lawyer Chen Guangcheng (陳光誠) break through Chinese dark cloud of lawlessness?